Winchester always has perfectly trimmed claws ... now! I have two cats, an Oriental and a Siamese. Trimming claws was a breeze with the Oriental from the beginning. He'll lie on his back while I do it ... purring. 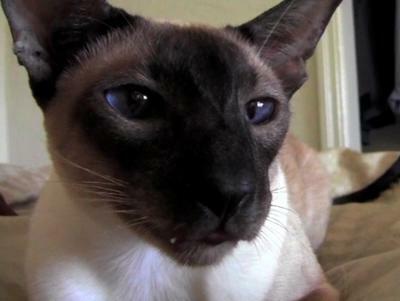 With Winchester (the Siamese), on the other hand, it just wasn't gonna happen. As a kitten, he was powerful, fast and skinny. He could work his way out of anything I tried. It was extremely stressful for both of us. On top of that, I lived alone - and since they'd hide whenever someone came over, having a helping hand was out of the question too. What was I to do? His claws were getting sharper and longer by the day. I considered the vet's, but had to let that go because not only would it be stressful for him, the ongoing cost would be ridiculous. I mean, realistically, claws have to be trimmed at least every two weeks. So this was my idea. I thought ... picking a cat up by the scruff of the neck is something of a tonic immobilizer. Often times, they purr. They certainly don't try to move, or squirm away, as a rule. I sat Winchester on my lap, and took his scruff in my teeth, supporting the bulk of his weight on my lap. He immediately started to purr! Using a pair of really strong reading glasses - his claws would only be about 2 inches from my eyes - I raised one of his paws into view. No fussing, just intense purring. All 20 claws .... trimmed. Perfectly. I did this for about a year. One day, I thought I'd try it without that fur-in-the-mouth scruff thing. Wouldn't ya know ... he dang well let me - with nary a fuss at all. Now, he lies on his back too - and purrs all the while! What a great story, Paul! This did made me chuckle. A really unusual solution to a 'thorny' problem. Thanks so much for sharing. I'll link to this from my 'Clipping Cats' Claws' page, too, as everyone deserves to see it. Note: Just a quick word of warning to others who might be thinking of trying this - please don't ever pick up a cat or kitten by the scruff of the neck without support - you might strangle them. Always take the weight of your cat, as Paul did, by supporting their legs and body from underneath. Paul also sent us another story about Winchester and Oberon and what happened when they had to go into a temporary home. Wonderful! Sophie is a rescued red point Siamese, she is sweet-natured but terrified of people. I've been working with her since last July 2017, and as a last resort I rescued an older lynx tabby point who loved people. It worked to a point, she fell for him and came in season (the charity and I thought she had been neutered), so she went to the vet and was neutered and the difference is amazing. She is still frightened of people but if I am on the settee with my legs covered and Oliver is on my legs she joins us, and so long as I don't raise my upper body I have managed to play with her feet and recently managed to cut three nails. It's slow going but she is definitely getting more trusting. My vet couldn't believe it was the same cat that he neutered as they had to treat her as a feral - even though she has never struck out at anyone she would have run and hidden up. Hopefully she will be with me and my Rotts (she treats them with disdain which is normal at least)and Oliver (who though never having known dogs has laid claim to all 3 dog beds!) for a good many years to come. Unfortunately, due to my actions during my baby girl’s first few years, I still years later am trying to get her comfortable with getting her nails clipped. Irie (her name) is super strong, yet also feels very fragile ... so I was too afraid in the beginning years to hold her too tightly to force her to allow the clipping. Looking back now, I do not know how I did not think about the negative effects of my actions. I should have realized it was not a proper path to continue down. I used to wrap her like a burrito in a towel or blanket so she could not escape me. I did at least always allow her to have two legs out at a time, but the other two were not escaping me. Thankfully, I eventually started to realize that Irie was more stressed with each time the process took place. No more of that. For the last few years I wait until she’s in lounging mode (usually after some playtime with me) then I get as many quick clips in at a time that she will allow, let her go when she gets too antsy, then I swing her mouse on a string around more. The process continues until I successfully get each nail trimmed! She is getting much better with it. I still feel bad about traumatizing my angel, we are all good now. :) They certainly do not like being forced! Thank you for sharing your thoughts, these are good points. I think the main thing to learn is that the claws don't all have to be clipped in one go - you can do one or two at a time, as you say, and gradually build up. Thank you for warning people not to pick up a cat by the scruff of the neck. I get so mad when I see people do that. I do speak up for the cats when I see someone doing that. People don't realize that that part of skin is only to be utilized for a mother so she is able to move her young babies around and get them away from danger. It is not intended to be used by humans to lift an entire cat. How lazy are people that they can't simply lift a cat from all four paws. I lift cats by supporting their entire weight. My arms lift one at the back and one at the front of their legs. Shadow (sadly deceased now), would just sit on my lap and hold up each paw for me to do - bit like his own salon. His favourite scratching 'post' was a square of carpet (underside up) that I left by my bed. Every night, after checking that I'd shut the house up properly, he'd come in, rip hell out of his square, jump up on the bed and push his way under the blankets next to my head. If it was hot and I only had a sheet on, he'd still go under and would often wake up clammy with my sweat (I sweat a lot at night). In his old age, if you spoiled any part of this routine, he'd jump down, go out of the room and start again ... but he was 16 by then. One of my Siamese lets me cut his claws without any problem. My other cat (his sister) actually screams if I try to go near her with any cutting instrument. She won't use a scratching pole and has ripped a piece of carpet on a step to pieces but it doesn't help her claws. She's an indoor cat. I have a modern and traditional Siamese that I have been trimming both of their nails every two weeks since they have been kittens. Mo (female-modern) just purrs ... and licks herself. She knows it's grooming time! Now Bushido ... he runs for cover. I have to burrito him (towel wrapped around him) and his ears go flat back to tell me he is not happy camper. Once he growled and I stopped and petted him for about five minutes with a soothing voice. He never did it again. I still burrito him and we do our nails every two weeks, but he knows the more he is quiet, the faster he is free to get his kitty treat! I always give them a yummy afterwards! I find also if you trim their nails every two weeks they don't use the scratching posts as often.